OPINION polls have reported that the Conservative lead over Labour has halved within a week to single figures — and in Wales Labour seems to be in the lead. 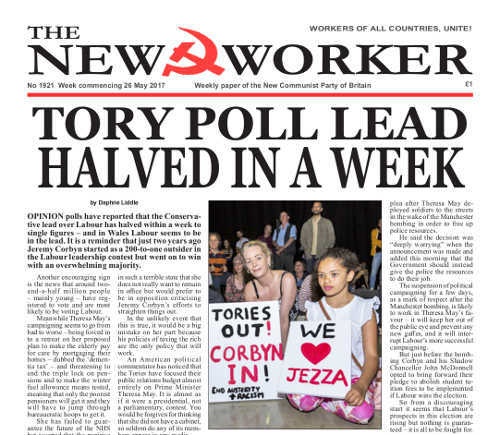 It is a reminder that just two years ago Jeremy Corbyn started as a 200-to-one outsider in the Labour leadership contest but went on to win with an overwhelming majority. THE NATIONAL Pensioners Convention (NPC) last week described Prime Minister Theresa May’s announcement of her plan to solve the crisis in funding care for the elderly by means testing them and taking into account the value of their homes if they are worth more than £100,000 as a “Frankenstein’s monster” of a policy. THE BOMB blast in Manchester on Monday evening was an outrage and a tragedy. The ultimate responsibility lies at the feet of the global imperialist forces, in particular those of the United States and Britain that bring war, aggression, interventions and indiscriminate bombings to countries in the Middle East and Africa whose governments refuse to kowtow to the great god Money. Tragedies such as happened in Manchester are, fortunately for us, rare and shocking events. For the citizens of Afghanistan, Iraq, Libya, Syria, Yemen and Palestine such events are common but no less tragic for that. And the perpetrators are the same people.